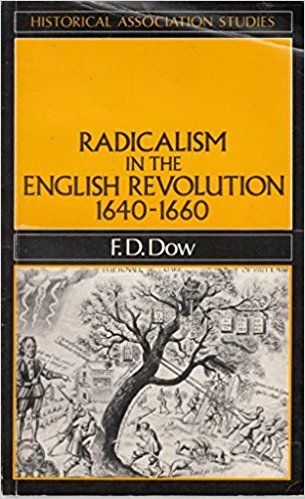 Radicalism in the English Revolution 1640- 1660 F Dow. Given the speed that historiography of the English Revolution is moving it is sometimes wise to look at where we have been to find out where we are going. A review of F D Dow’s book would be a good place to start.Written over thirty years ago, Dow’s book was aimed at students and the public. Her book is of an excellent standard and in no way dumbs down her writing. In fact, given that her target audience was pre-degree students it is of a very high academic standard. Her assessment of 1980s radical historiographies is precise and informative. Today’s readers should bear in mind that at the time of Dow’s book revisionist historians had been attacking any historian who sought to place the Levellers in their proper historical context. This had been going for decades.More specifically Dow believes that most of the revisionist’s fire had been against Marxist historiography especially any understanding of the importance of any long-term causes of the English civil war. Dow explains that the turn away from Marxist historiography brought about a plethora of other explanations as to why the radical groups were not really that radical.Conservative historians such as by A M Everitt and later John Morrill sought to examine social aspects of the revolution while playing down the influence of the extremists. Other revisionist historians such as John Adamson limited the civil war to a struggle amongst the nobility not a class struggle in his Noble Revolt and his forthcoming Noble Realm. This has led to the muddying or an outright denial of class struggles in the English civil war.Despite agreeing with many conservative historians, Dow does not buy into the premise that there were no long-term causes of the revolution or for the rise of radicalism. I don't see how the profoundly Biblical Puritan English revolution can be made to fit a Marxist/materialist explanation. You need to look at how the role of the Bible's teaching on social justice led to the revolution. Israel got its first king against God's will, so as to be like other nations. The Puritans knew that God did not sanction a monarchy. Leviticus 25 is critical here. At the moment your email does not warrant a long reply. What I will say is that I am not trying to fit a Marxist/Materialist viewpoint into the English Revolution. The point of Marxism is it is a method in which to understand the past, present and a guide to future action. I do not subscribe to the view that the revolution was a chemically pure one. Marx never said it was. Also, I do not downplay the religious aspect to it, how can I. Its main protagonists were deeply imbued with it. However to say that God caused it or that he was on the side of the Roundheads is absurd. How do you explain that Charles 1 refused to accept parliaments and Cromwell’s authority because he was the sole interpreter of ‘Gods Will’? To finish, I do not say that the role of the individual is unimportant at certain times it is critical. But the revolution was the product not of Gods will but powerful socio-economic changes that that were pulsing through Britain and come to think of it Europe at the time. Man makes history but not as freely as he would like. Like many similar historical subjects, there is little agreement among historians as to the origins of the war to end all wars. Some right-wing historians have attempted to rehabilitate the First World War, as a “necessary” war for democracy. As Sherry states “That is one of the reasons I wrote the book. 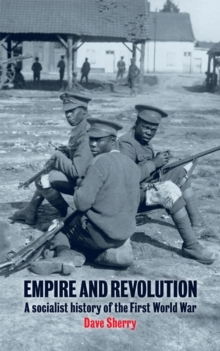 There’s a truly myopic view of some British historians who see it as just a war on the Western Front”. I have just received these comments on my Essay Oliver Cromwell, the Levellers and the Putney Debates. While it is important to correct factual errors which I will do one does not have to agree with his more general summaries in the second part of the email. In fact, I will begin to reply to his assertions regarding Hill and Manning in particular shortly. I am publishing his remarks in full. 1) If you look at Past and Present (Number 88. August 1980), you will see, for example, that the Levellers did argue for manhood suffrage at the Putney debates. C.B.Macpherson's interpretation is based on a misreading of the text preserved amongst the Clarke Mss. There was no Digger group in existence in the autumn of 1647. I could continue with the errors of fact in this piece. 2) Many thanks for your e-mail. This would be a sizeable job. For example, you claim that the Levellers pioneered the use of petitioning, large-scale demonstrations, etc., as devices for exerting political pressure in the mid-1640s but, as Valerie Pearl showed back in 1961 in her book on London and the Puritan Revolution, these measures were first used in 1640-42 by Pym's Junto: John Adamson's recent book on The Noble Revolt leads to the same conclusion. There were some elements within the Leveller movement but none, in the light of Rachel Foxley's work or that of Philip Baker that can justifiably be described as 'bourgeois.' Most academic historians, of whom I am one, do not accept or endorse a 'class explanation' of the struggles of the 1640s in England or the British Isles. This is why figures like Christopher Hill (my old doctoral supervisor), Brian Manning, etc., are rarely cited in the literature nowadays. It would take me a significant amount of time to go through all of these matters in detail, but I will consider your request.